If you’re following along, yesterday I posted the recipe for basic sushi rice and showed a couple of steps for making a basic sushi roll (maki sushi). I know many of you are resisting even the thought of making your own sushi, but I’ll give one single reason to do so – money. Sushi restaurants, even the hole in the wall ones, are pricey little places. A few pieces, a couple of rolls, and you can find yourself facing a staggering bill. My husband, who usually just eats without much comment, said last night this sushi was as good as he’s had in any restaurant. So there, Sushi Den! 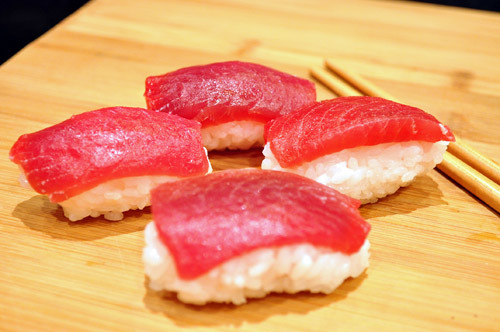 So let’s get started with my favorite ingredient for sushi: tuna. 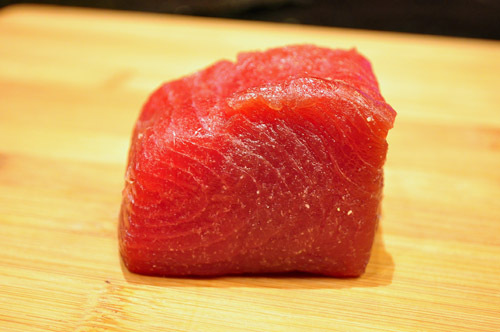 You need to start with a really nice piece of sushi grade tuna. That sushi grade is what tells the seafood purveyor that it’s been properly handled to prevent contamination so it will be safe for consumption raw. My daughter, who is on a college budget, insists on making sushi from any old tuna she gets at the grocery store – any suggestions on how to convince her this isn’t safe, please feel free to pass along! Sushi grade fish is expensive, but the good news is that you don’t need that much of it. About 4 ounces, so about $7.00 worth, was enough tuna for me to make one large spicy tuna roll (on the left), four pieces of nigiri sushi (the tuna on rice in the center)… …and another large roll with tuna combined with vegetables. Spicy tuna rolls are often a favorite of “beginner” sushi eaters, so give that a try if you have some novices dining with you. And mixing the tuna with some avocado, cucumber, carrot and scallion is a great way to get your veggies and to stretch your tuna dollar. Plus the colors are stunning when you present the sliced roll on its side like this. The technique for the rolls is here. To make the nigiri, simple mold some sushi rice into a small football shape in your hand (use water on your hands so the rice doesn’t stick), spread a little wasabi on a thinly sliced piece of raw fish, then press that on top. Serve your sushi with some pickled ginger, wasabi, and soy sauce (all available at the grocery store) and don’t forget the chopsticks! To create Spicy Sushi Sauce, combine sesame oil, chili paste, soy sauce, garlic and mayonnaise. 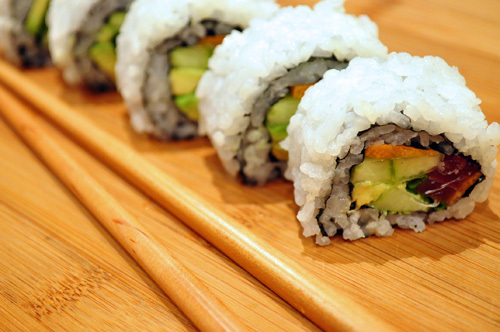 Use inside sushi rolls or as a mix for spicy tuna rolls. 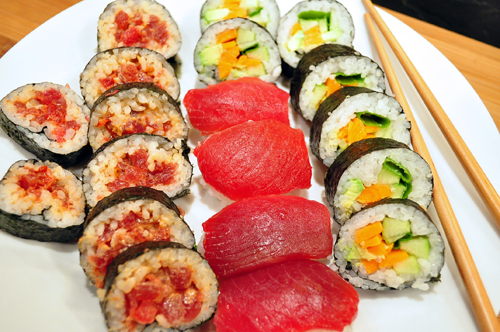 To make spicy tuna rolls, lay nori sheet shiny side down on sushi mat. 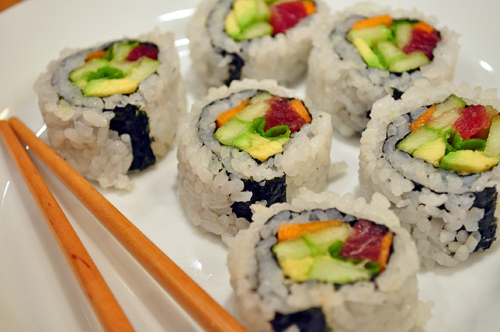 Press about ⅓ cup sushi rice into the nori sheet, leaving about ½ inch gap at the top. 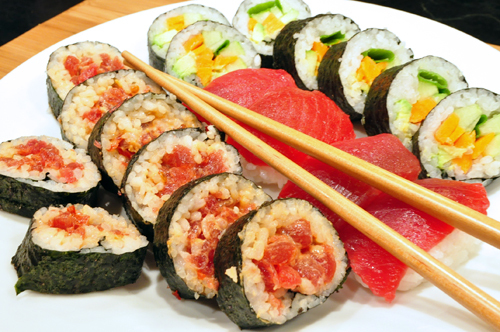 Mix tuna with 1-2 tablespoons of the Spicy Sushi Sauce and scallions, then spread down the middle of the nori sheet. Roll up nori away from you, pressing with the mat to seal. Place seam side down and cut into 8 pieces. Food for Thought: Coincidence or Karma?